In 1993, Sandra and Joseph Rotman, made a gift of $3 million through the Rotman Family Foundation towards the construction of a new state-of-the-art facility for the University of Toronto’s Faculty of Management. 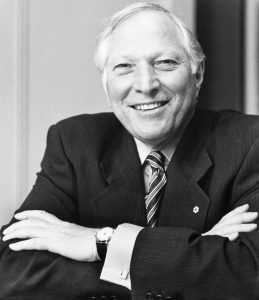 An additional gift of $15 million followed in 1997, and the School was aptly re-named in Joseph Rotman’s honour. Under the leadership of former Dean, Roger Martin, the Rotman School of Management became the number one business school in Canada, as ranked by the prestigious Financial Times rankings. Pleased with the School’s progress, in December of 2007 the Rotmans made a further gift of $18 million to the School: $10 million towards the newly-established research centre, The Martin Prosperity Institute (established earlier that year by a $50-million grant to the Rotman School by the Province of Ontario); and the remaining $8 million to support various projects including the University’s undergraduate Commerce program, now known as Rotman Commerce; the School’s award-winning magazine; the construction of an expansion of the School adjacent to its current location; and ongoing academic research activities at the School.